Pick up a coffee on the way to work every morning or when you grab lunch? 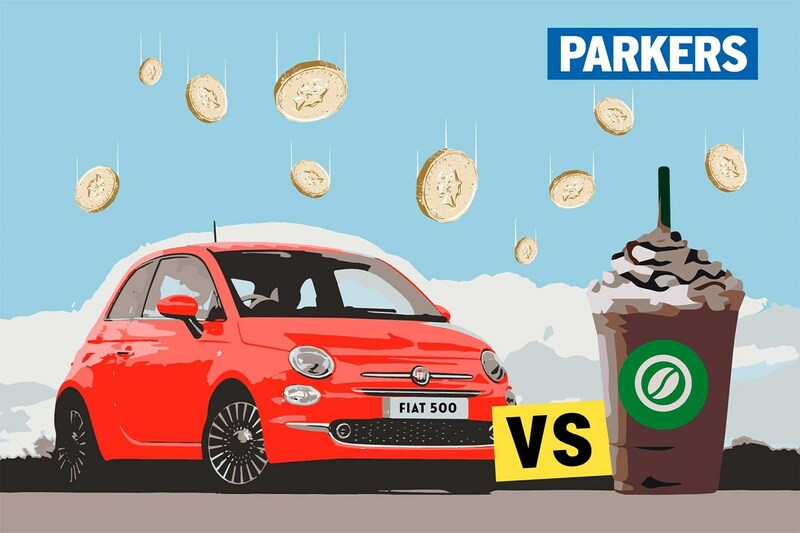 If you have expensive tastes and end up splashing out £5 per day on your caffeine habit with a posh iced coffee – or simply pick up a couple of caffe lattes during the day – you could afford to lease a brand new Fiat 500 by canning the coffee. More than this, opting for the supersized iced coffee from one of the UK’s largest coffee chains could hurt your waistline as well as your wallet, as this could contain more than 500 calories, over 70g of sugar and half of your daily recommended allowance of saturated fat. The Fiat, meanwhile, is calorie free. Better still, with the savings from choosing the car over the coffee you could afford 22kg of Java ground coffee – enough to keep you in daily cuppas for four years; the length of the Fiat lease. Or 8,250 cups of instant coffee – enough for five cups per day. Plus that Fiat 500 of course. Video: PCH leasing – how does it work? Video: PCP finance – is it for me? Should I get car finance or a loan? Add all those costs together and the 500 costs £147 per month overall. 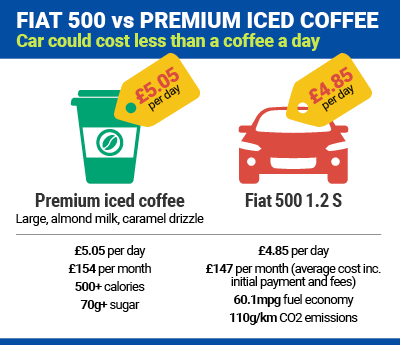 That’s £7 per month less than grabbing a daily iced coffee – large with almond milk and caramel drizzle – from one of the country’s best known coffee shops, saving you £297 over four years. Caffeine is a powerful thing, but if you make a daily pilgrimage to grab a coffee on your way out in the morning, it could be costing you far more than you realise. Opt for a standard iced coffee from an upmarket coffee house and it could set you back £3.75 per day. Supersize it and that rises to £4.15. But if you need to avoid dairy and go for almond milk and add a caramel drizzle, that could set you back more than £5 per day. That means that a coffee a day could dent your bank balance to the tune of more than £150 per month. If your tastes aren’t quite as exotic and you grab a basic Flat White in the morning and at lunch, that could cost you even more. A standard Flat White might cost you around £2.70, so pick up two per day and you’ll be spending £164 per month. Fear not, if you need a hefty dose of caffeine to get you going. Swap the coffee shop iced coffee for the car and you’ll have enough change for a cup of premium Java ground coffee every morning. Or if you’re happy with instant coffee, you could afford five cups a day – perfect for coffee junkies who can’t do anything without a caffeine hit. Stick to your mileage allowance with the car and make sure to keep it in good condition and there should be nothing else to pay when you hand the keys back. If you’re new to car leasing – also known as PCH (Personal Contract Hire), take a look at the Parkers guide to PCH leasing to see if it’s for you.